If skeletal robot-pirates are your jam, you’re going to want to listen up for this one. New from Dark Horse Comics is the Legend of Zelda: Skyward Sword Scervo statue figure. He stands 11 inches tall and represents the best of both statue and figure worlds. This villainous warrior engages Link in battle on the Sandship, armed with a drill, which acts as a sword infused with electricity. He also comes packaged in deluxe color gatefold collector packaging. We’ve got Link, too, so don’t miss out! The little dude in green is back. Bring the Nintendo action-adventure video game to the comfort of your own collection with this new Link Ultra Detail Figure (UDF) PVC statue from Medicom. He’s jumped right out of the screen of The Legend of Zelda: The Hyrule Fantasy‘s gameplay. Drawing upon the rich history of the video-game franchise, this PVC guy is straight out of 1986. What more could a Zelda fan ask for? 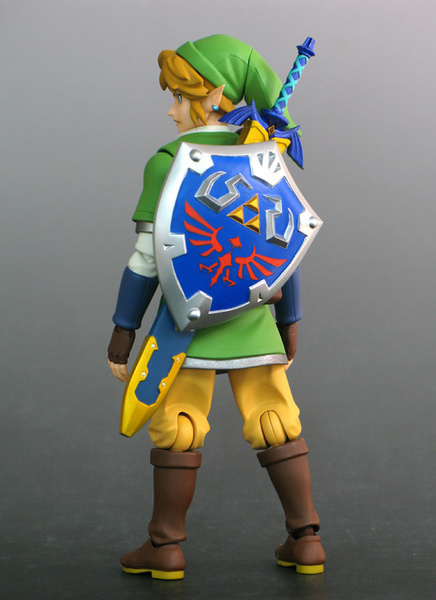 Link stands three inches tall and comes in standard blister packaging, making him ideal for display. Click on the picture below and don’t miss out on Link when you’re doing your holiday shopping! One of the most iconic villains in video game history, GANONDORF finally arrives from Nintendo and First 4. Standing an impressive 23 inches tall, he’s an awe-inspiring statue cast in polystone and hand finished and painted. He features an incredibly detailed authentic hand-tailored fabric cape featuring wires that allow for awesome poseability. But forget that… just look at him. He’s a UK import and his design reflects his look in Twilight Princess. Standing a full foot tall, LINK finally has the highly-detailed, beautifully-designed figure he has long deserved. Nintendo’s always been a little weird about producing top-quality merch (still waiting on that perfect Samus figure) and so we’re always pleased when things like this happen. 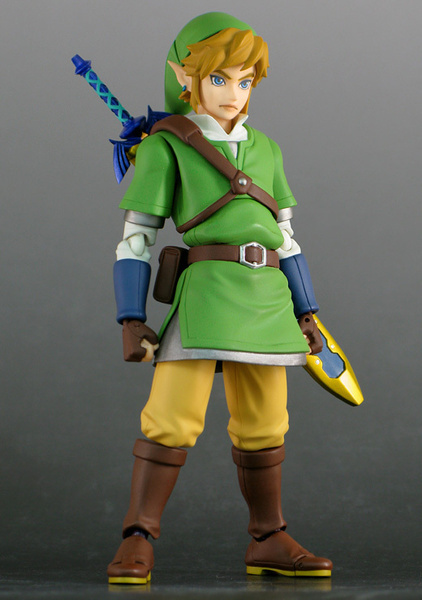 Link comes with two interchangeable facial expression parts and 4 eye parts to allow him a variety of expressions and he also includes weapons, accessories and a figure stand. Legend of Zelda fans rejoice! 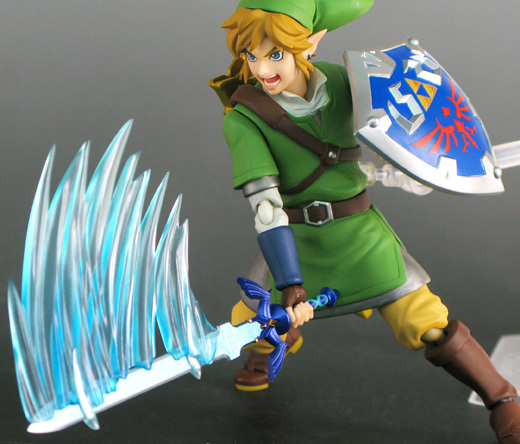 A UK Import from First 4 Figures, this is one figure Legend of Zelda fans won’t want to miss! At 23” tall with the detailed base, he’s every bit as imposing (and creepy) as you’d want! Showcasing both his regal design and the darkness in his eyes, Ganondorf has really never looked better. Nintendo’s always been a little late to the party when it comes to creating collectibles for its wealth of franchises, but when they go for it, they always knock it outta the park. Ganondorf comes with an authentic, hand-tailored cape and is packaged in a full-colour, hand-numbered box with an authenticity card. This might just be the Link figure to rule them all (sorry– we’ve got LOTR on the brain with all that Hobbit news). Featuring a ton of articulation, the Master Sword, his Hylian Shield and a switch-out head for those days when passivity needs to be replaced with pure rage. As you’d hope, his sword and shield can be carried on his back. It’s a great item celebrating a great franchise and fans should definitely rush to pick it up! Pre-Order NOW and it ships in October! Here are some additional pics to get you drooling. In North America, Nintendo has always been a little weird about its merchandise. There’s been a lot of cheap stuff, a lot of strange branded items, but not a lot of true collector’s pieces. And in an age of high-detail, high-end figures and collectibles being issued for the big game releases, it’s odd that some of the most enduring characters and franchises still haven’t gotten their due. The statue stands a whopping 17 inches tall and features Link on a rearing Epona, brandishing the Master Sword and looking exactly as awesome as you know he should.